It’s here! Hooray! I managed to pull myself away from pinterest and polyvore for just enough time to bring you this latest tutorial. I bet you’ve been waiting all week for this little beauty… the Piped, Zipped (or Zippered if you’re that way inclined) Cushion! Phew. There are a number of ways to put a zip into a cushion cover, the most conventional of them being tucked away up at the top of the cover. 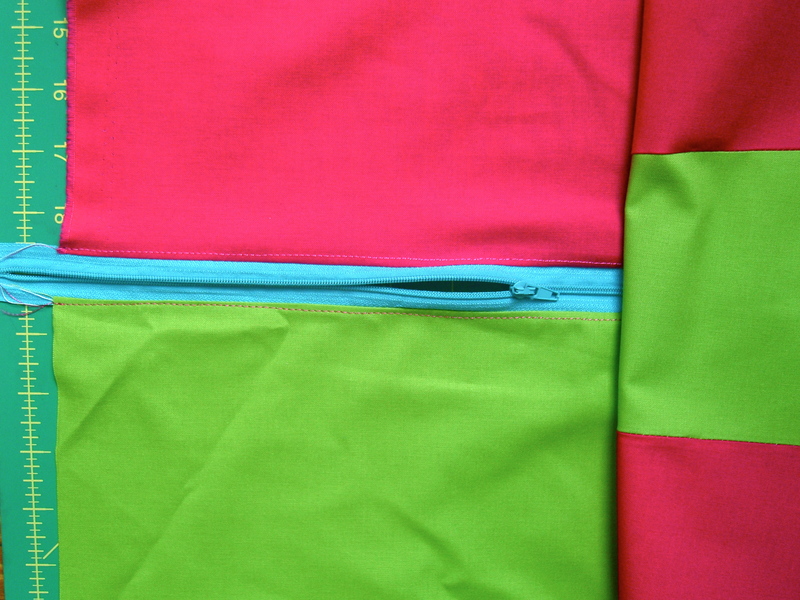 However, I have a thing for brightly coloured zips and wanted mine to be on show, so it’s showing off right in the middle. You can be as creative as you want with it, ⅓ of the way up, ⅔ of the way up….diagonal even…woah, yes, I went there. You can even hide your zip with a little flap if you don’t want it to be seen. The possibilities are endless! 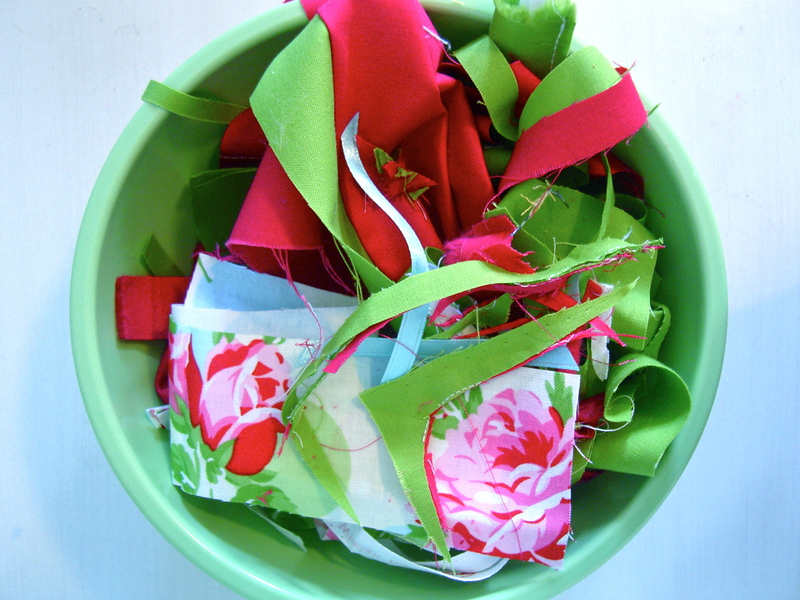 And you thought cushion cover making was boring…pah! Ok, boring part over… here we go, hold onto your hats! 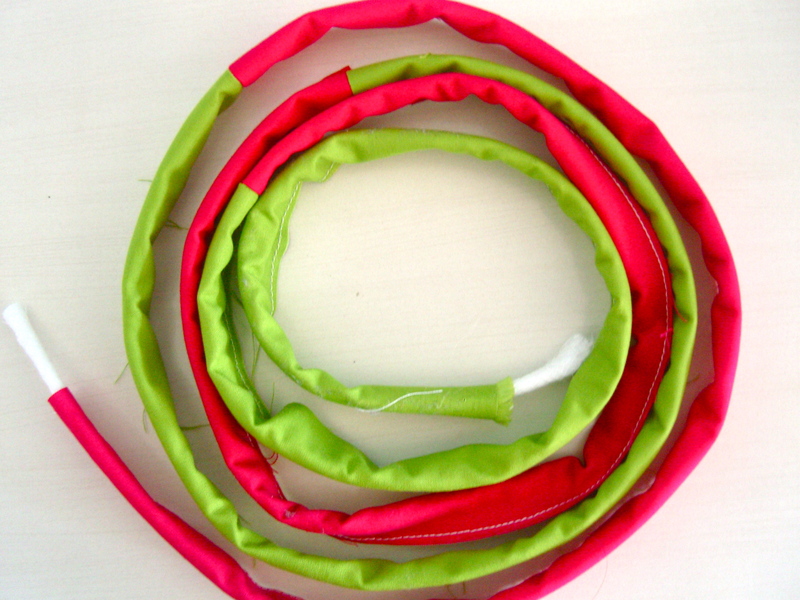 Extra fabric for your piping, this should be 4 x the length of one side of your cushion. If the cushion is rectangular, simply find the perimeter (woo, high school maths!) and that’s the length that you’ll need (plus a little extra for wiggle room). It only needs to be about 2-1 ½ inches wide. A zip, needs to length of the cushion plus a couple of inches, in my case, 2oinches. 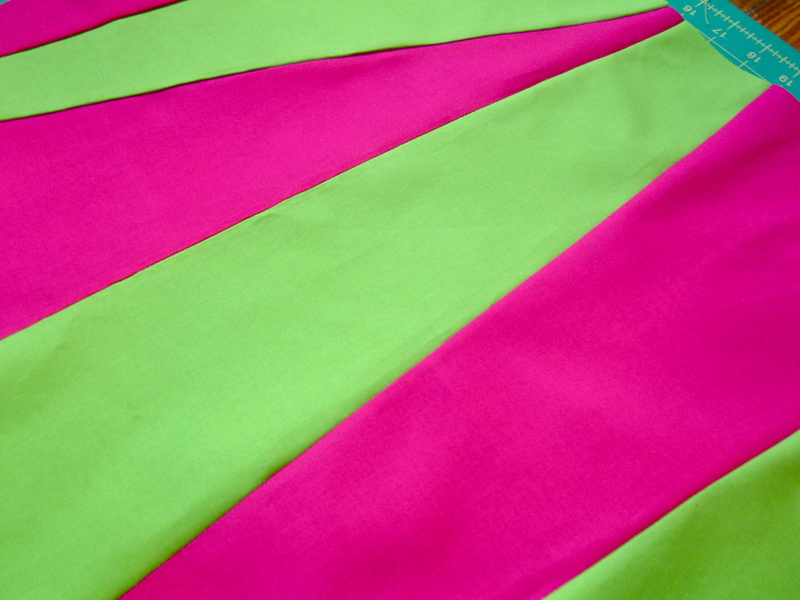 I wanted to do a crazy solid cover to liven up our couch a bit, and I’m quite a fan of the bright pink and green combo. 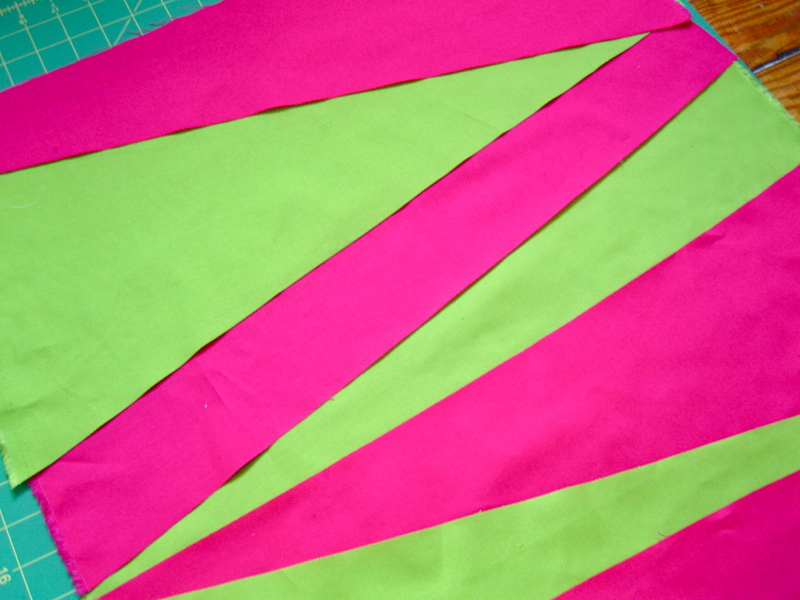 So, my first step was to cut large, random triangles from each colour. Here again, you could go totally wild with your design. 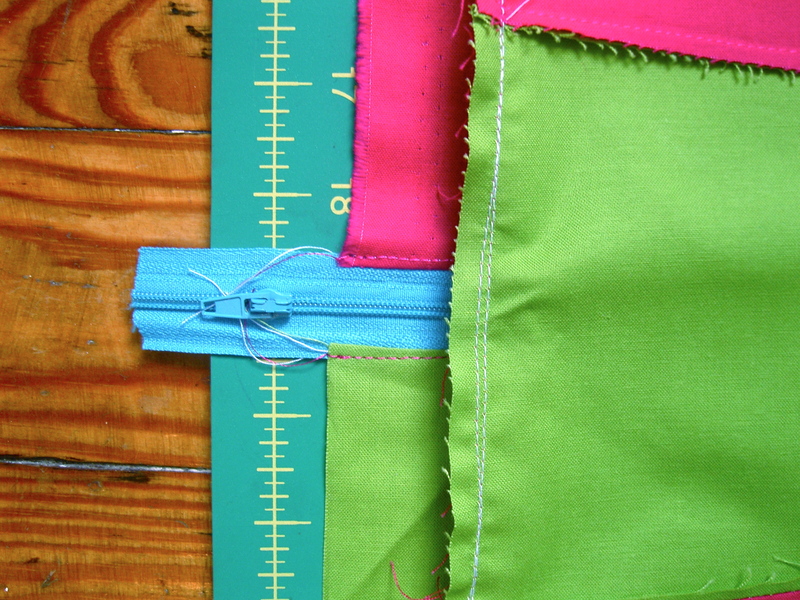 Patchwork, solid, crazy prints, stripes… but if you chose to do something that need to be sewn together, it’s always best to lay out your design and then pin it slowly, checking that you’re pining the right parts together. This may sound as though it should be quite self-explanatory but it is not so easy if you’re using solids as there is no simple way to determine ‘right’ and ‘wrong’ sides of the fabric. 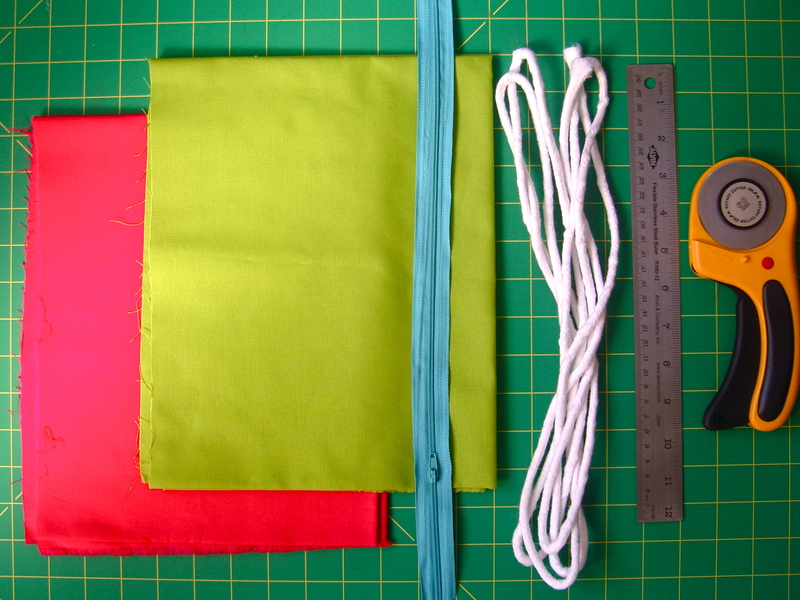 Whatever design you are (or are not) doing, make sure that the total sewn together piece is large enough to work as the front panel of your cover. 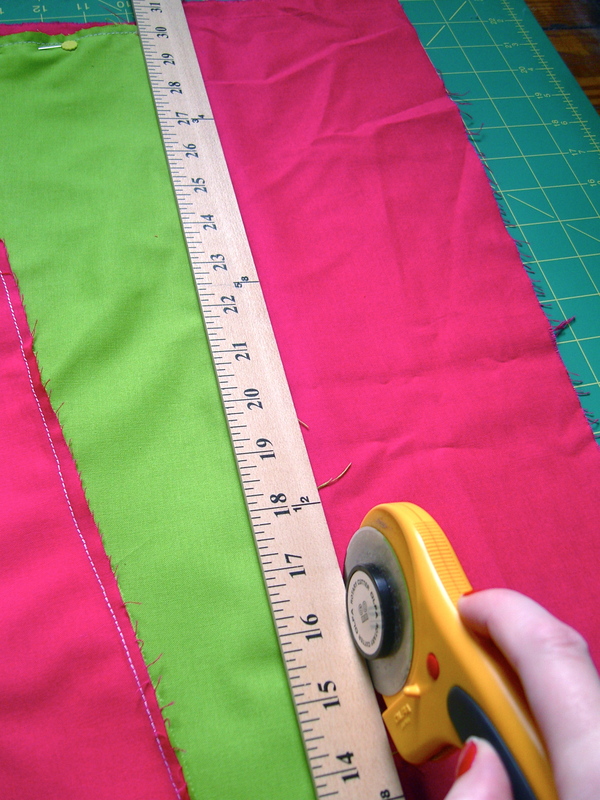 My cushion is 18inches square, so with a seam allowance of an inch either side, my front needed to be 20inches square. 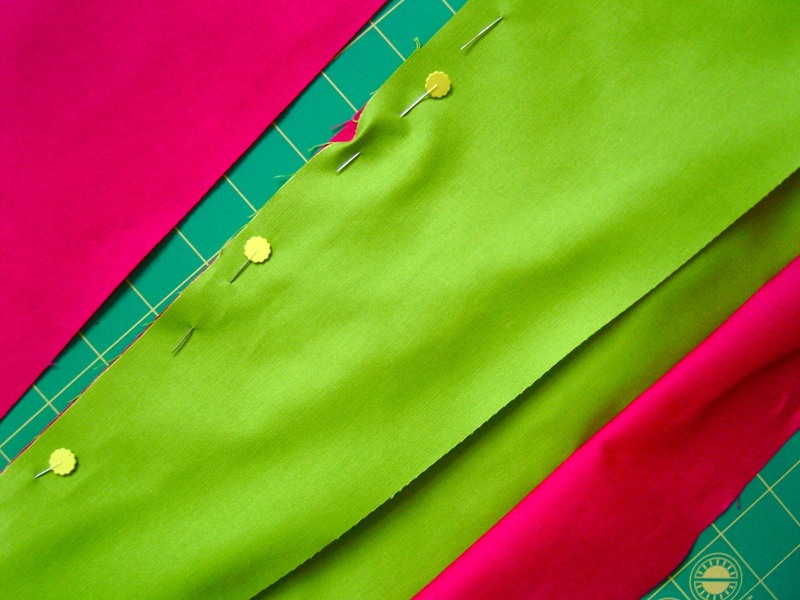 Once pinned, sew together and press out your seams. 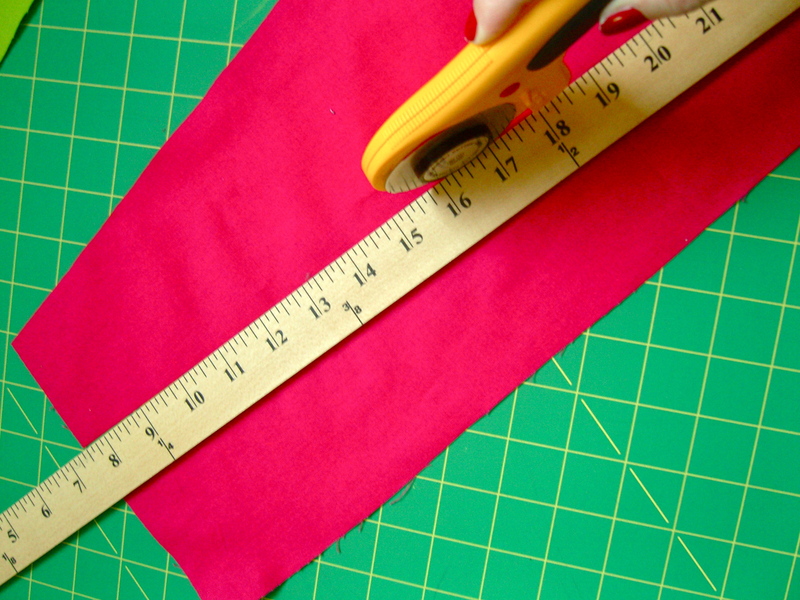 You may find that you need to trim the edges to get the desired shape and dimensions for your cushion. Next…the piping! For more detailed instruction on how to make the piping, check here. I went for alternate pink and greens. This cushion is going to be mental! So, I made a small adaption from the last tutorial for how to attach the piping. 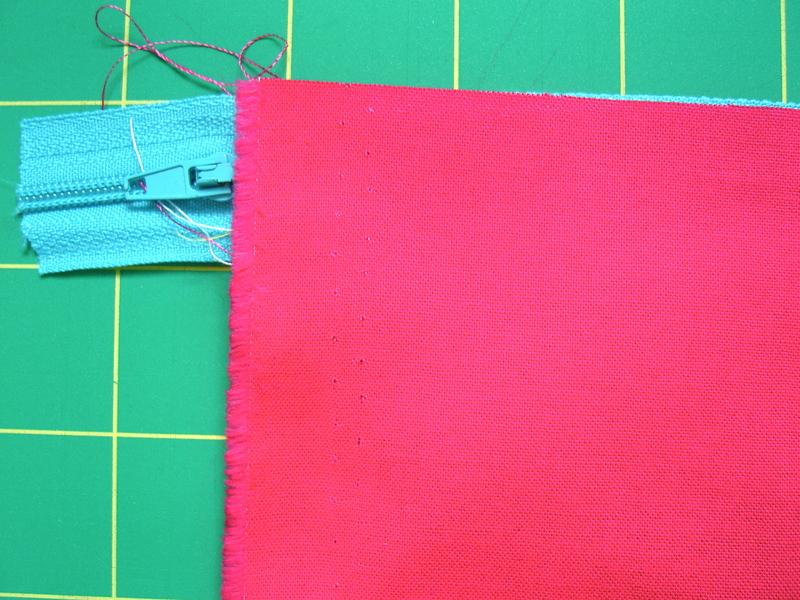 This way the piping gets sewn to the front panel first and then the back is sewn on separately. 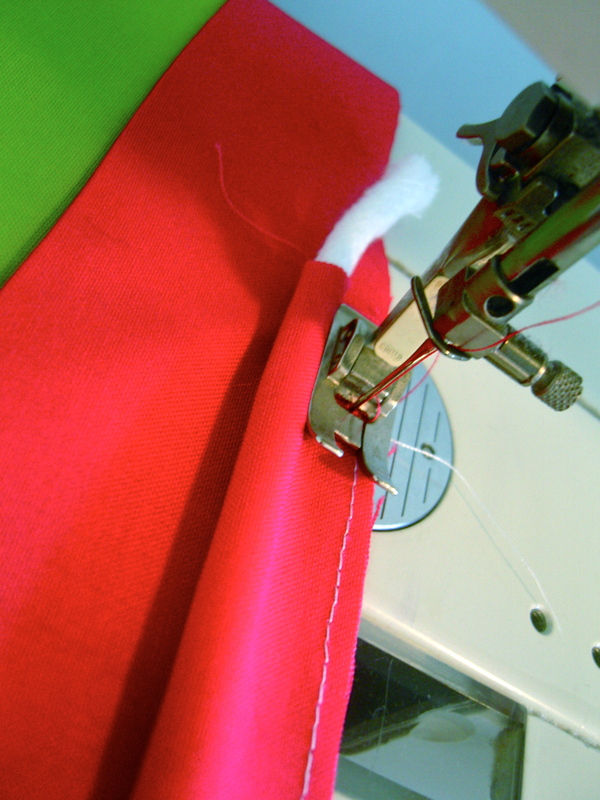 If you wish to sew it together all at once (front, back and piping) simply switch the steps around so they work for you. 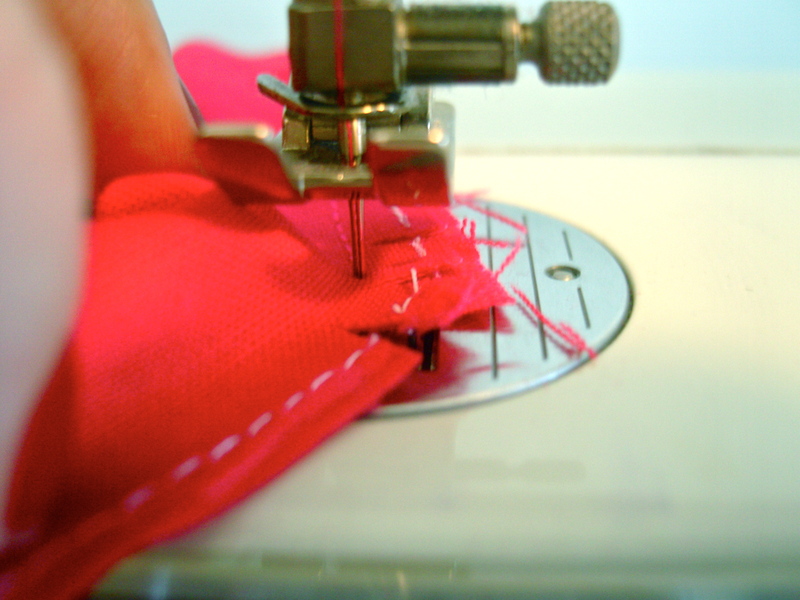 There is no pining in this method of sewing the piping on because you need to be able to wiggle it around a bit. Start by holding the piping onto the RIGHT side of the front panel, making sure that the piping is facing into the centre of the cover. Ok, now this is where you really need to pay attention. 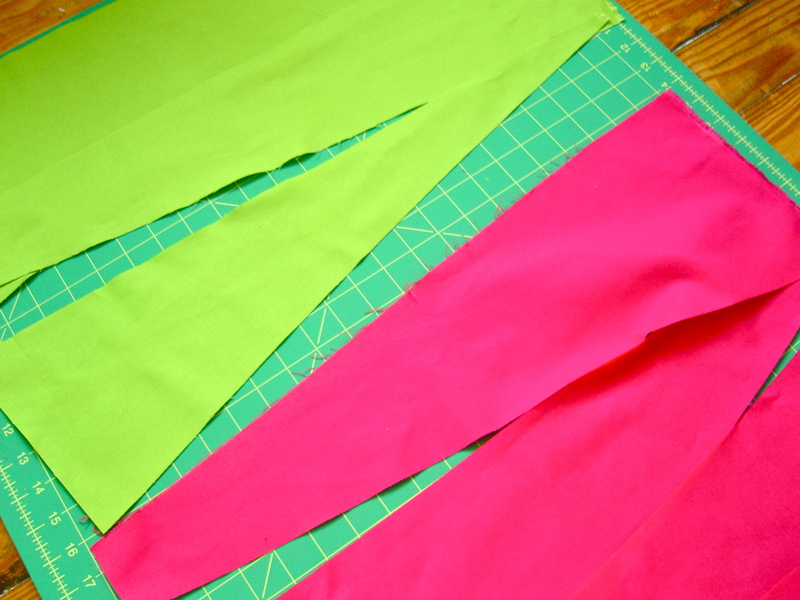 Start sewing, holding the piping in place as you go. Take it slowly as it’s such a pain to unpick it all if you go wrong. 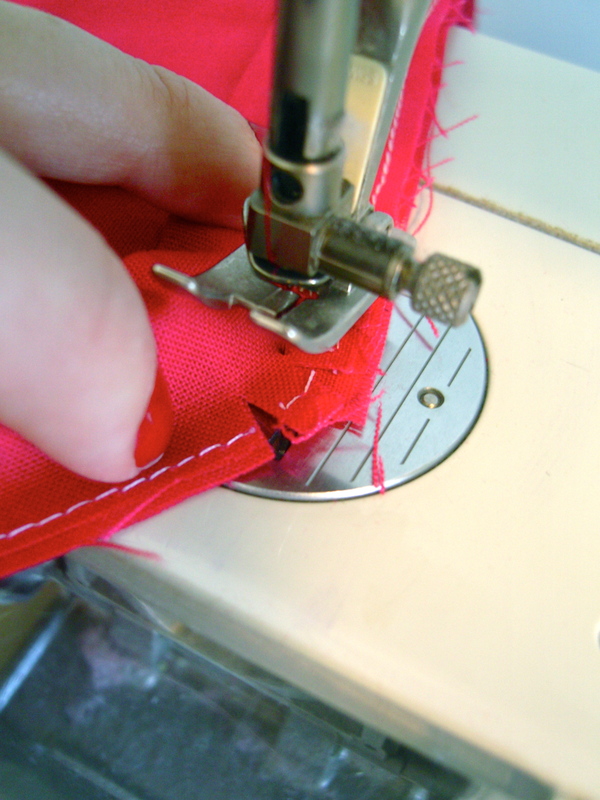 Now….when you get to a corner (and not before) leaving the needle in the machine down, but the foot up, make 3 small snips in the piping. 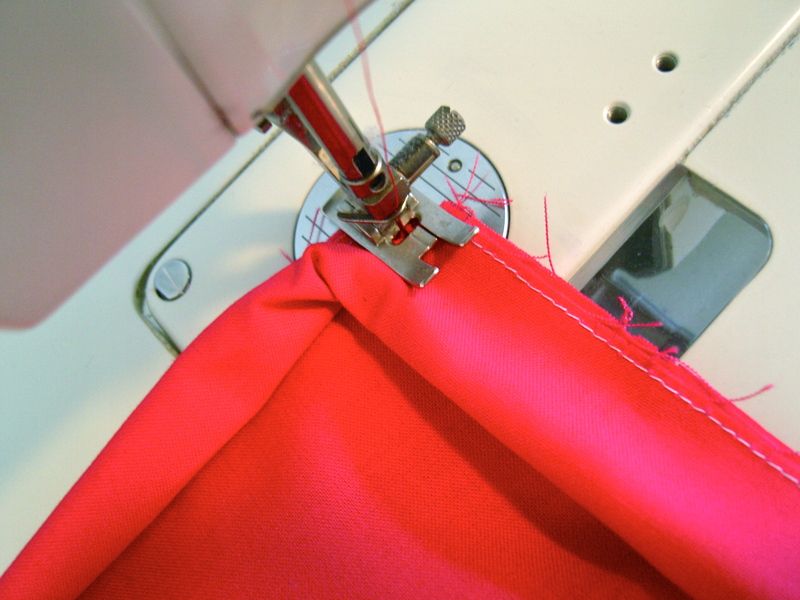 Bend the piping round the corner, turn your fabric 90 degrees and then continue sewing. Sounds tricky, but it really rather easy. Continue this method for the remaining 3 corners, until you get to where you started. Tuck the last little piece into where you started and hey presto, you’re done! Well, with that part anyway. Pin in place and sew. 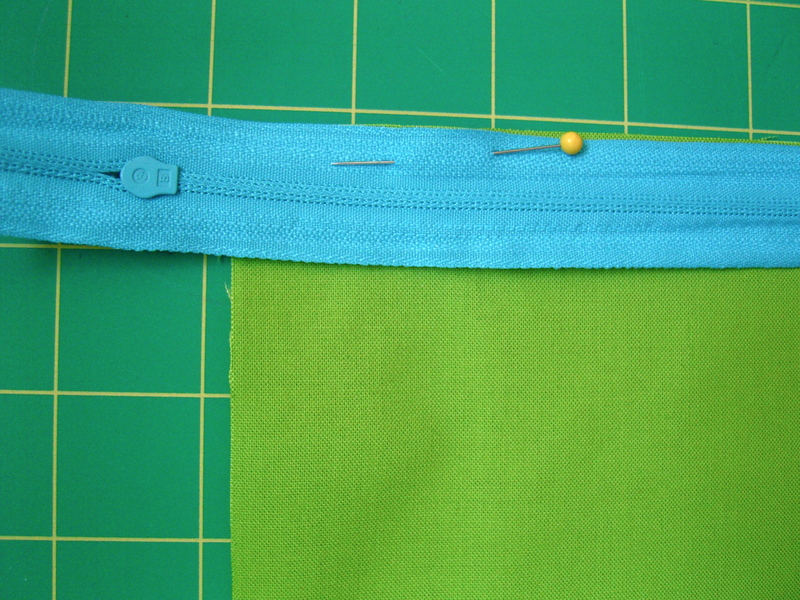 Turn the fabric right sides out so that you can see the right side of both the zip and the fabric. 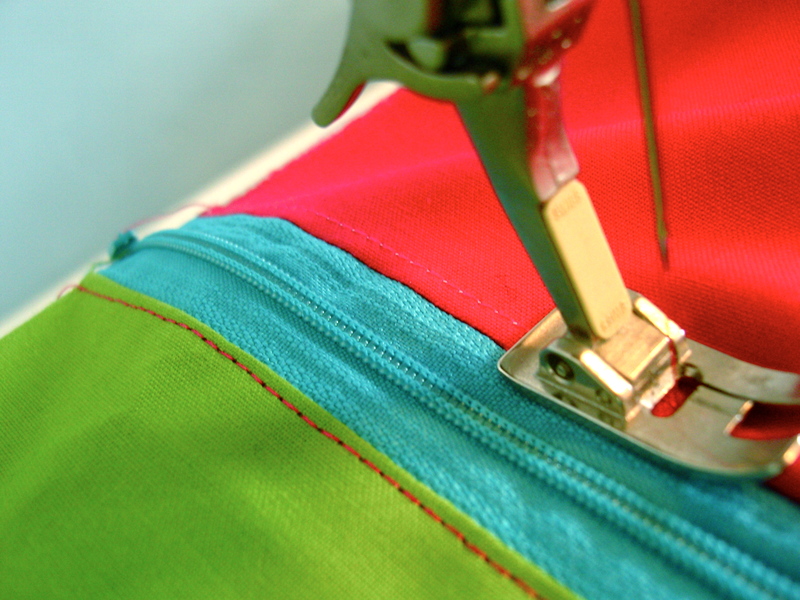 Pulling on the seam so that the fabric is taut, sew back along the top of the fabric to secure the zip in place. 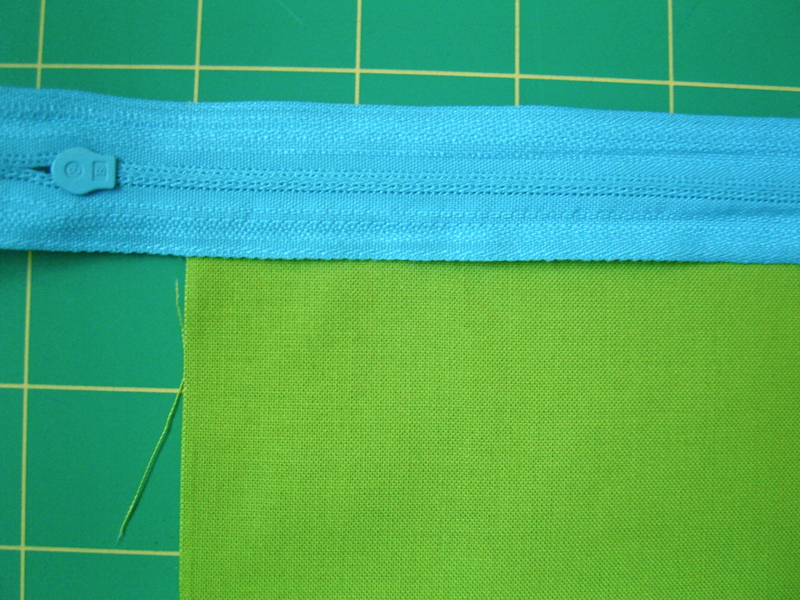 Repeat with the second piece of fabric on the opposite side of the zip. Sew in place to secure and there you have it. Whoop-de-doo! So all there is left to do now is to line up the front and back piece right sides together, pin and sew in place. 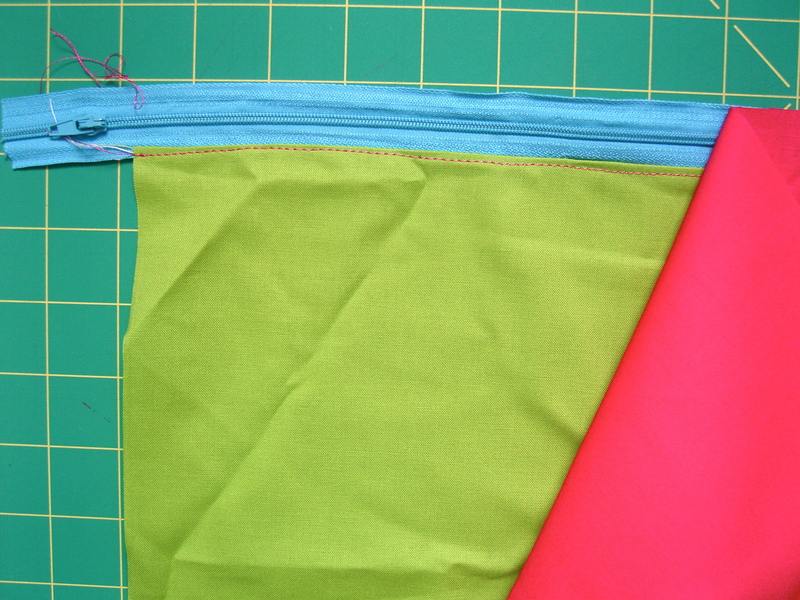 Take extra care to ensure that the piping is sandwiched nicely between the two pieces and that you’re not going to sew over it or leave any out. But WAIT! Most importantly of all…. 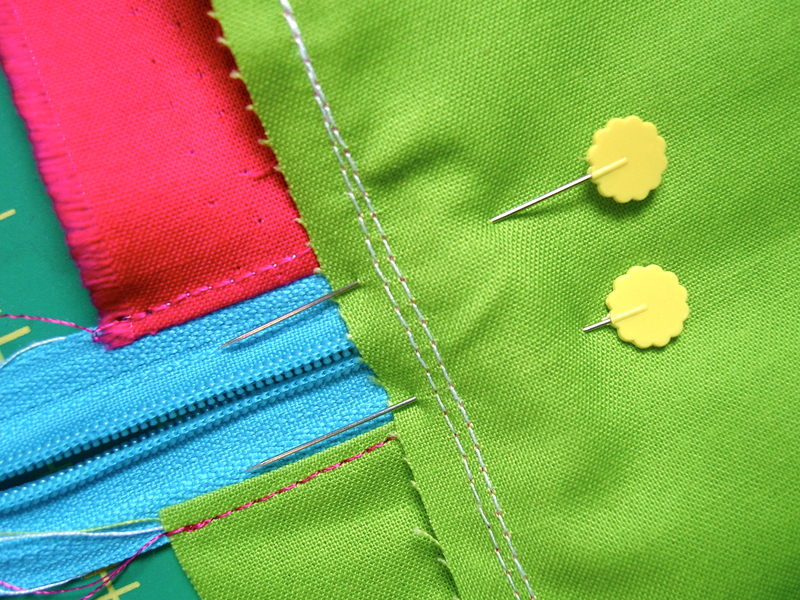 Make sure that you have opened the zip ⅔ to ½ of the way BEFORE you start sewing. 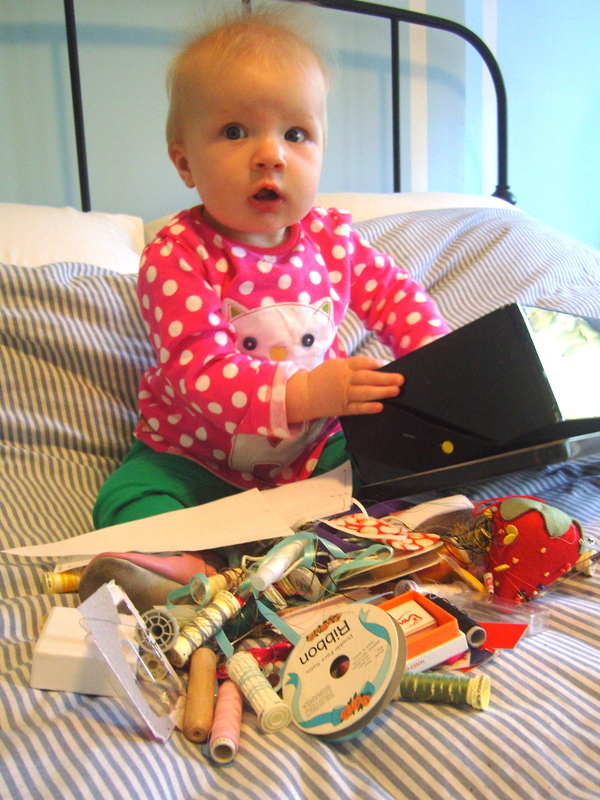 This is absolutely crucial if you want to be able to turn it inside out…which of course, you do! Make sure you secure the two sides of the zip in place where it is now open as you don’t want them to be all higgeldy piggeldy. So, you’ve piped, you’ve sewn, you’ve zipped, you’ve sewn, you’ve pinned, you’ve sewn…all that’s left to do is turn that bad boy inside out and admire your handy work. Now to show it off to anyone who will look/listen for anything upwards of a nano second. Lap up the praise, you deserve it! Wishing you all a wonderful weekend, the fun doesn’t stop here for me, I’ve got custom ordered quilts to make. Yippppeee! 19 Oct	This entry was published on October 19, 2012 at 4:33 pm. 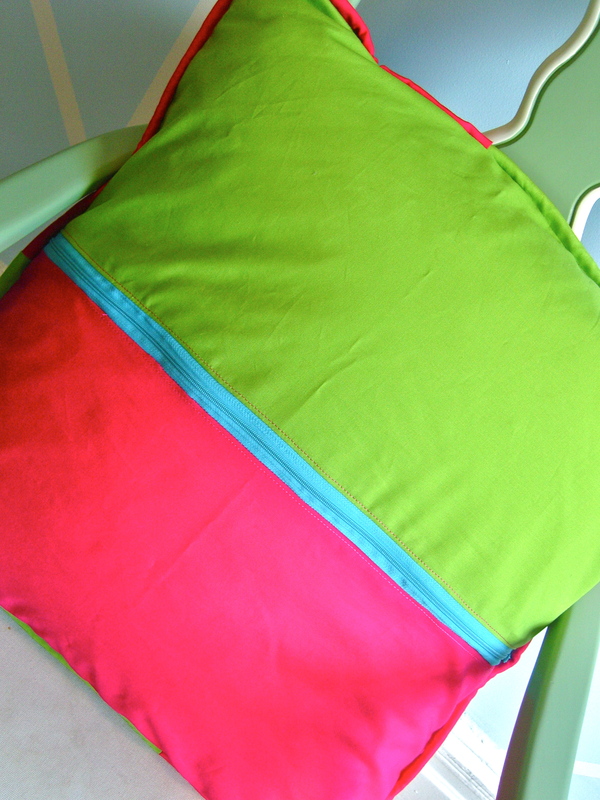 It’s filed under Uncategorized and tagged cushion, piping, tutorial, zip. Bookmark the permalink. Follow any comments here with the RSS feed for this post. You’re welcome! Really hope it all makes sense! 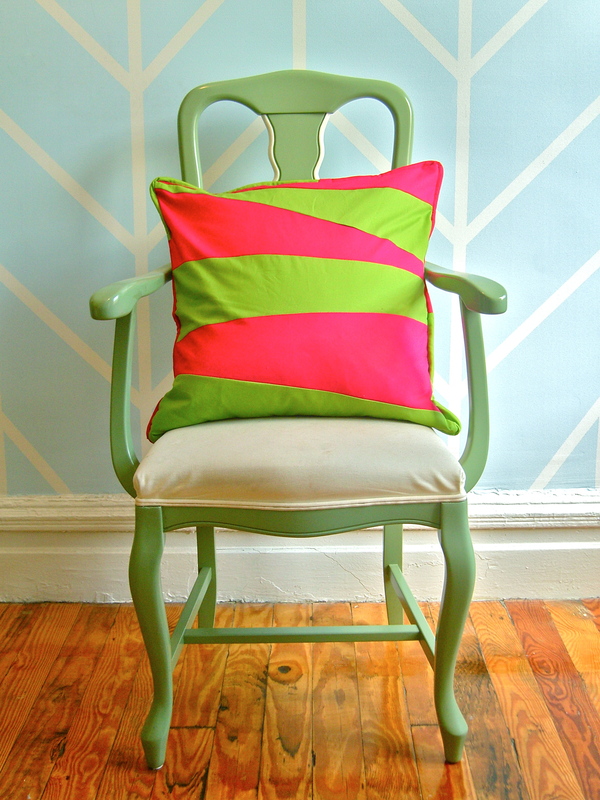 I absolutely love everything about that cushion, the colours, the pattern – I want it!! !